1. Heat a little olive oil in a sauté pan and add the onion and fennel slices. Stir over a medium heat for 5 minutes before adding the wine, tomatoes and peppers. 2. Bring to the boil to cook off the alcohol, then reduce the heat and add the potatoes. Cook five minutes then add the fish. Cover with a lid and cook for five minutes. 3. Gently stir in the mussels, re-cover the pan and cook for a final 5 minutes. Discard any unopened mussels and stir in half of the herbs. 4. Transfer to warmed bowls and scatter with the remaining herbs and fennel fronds, if using. Serve with thickly sliced sourdough or granary bread. Including a variety of fish in the diet is essential to gain all the health benefits they have to offer – fish such as salmon, for their omega 3 and 6 fatty acids; white fish such as haddock for their B12 and folic acid contributions; and shellfish such as mussels for their impressive mineral content. 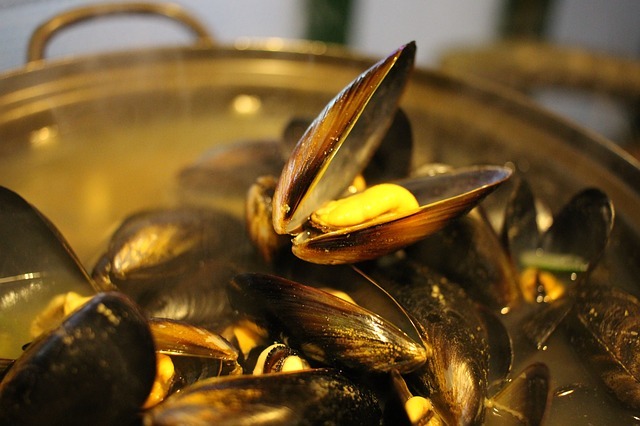 Mussels are pretty amazing in terms of their health benefits, in fact theirs is the best nutritional profile out of all the shellfish. They have those important long chain fatty acids – DHA and EPA, which have many benefits. They help improve brain function, as well as being able to reduce inflammatory conditions. They have a good many minerals, including zinc, to help your immune system.